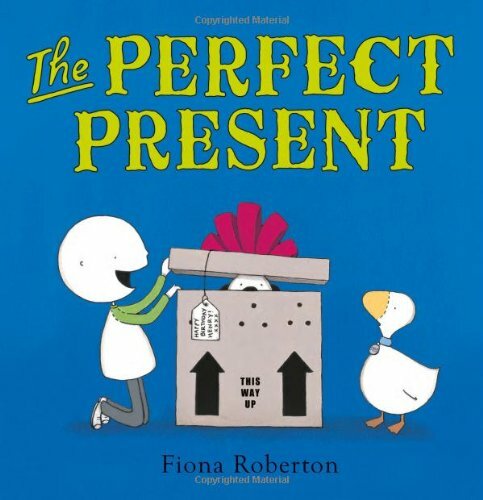 Spot, Henry’s pet duck, believes his gift of a fishing rod to Henry will be ‘The Perfect Present’. But when Henry is given a boisterous puppy, Spot is bereft. Sad little cameos of Spot tugging Henry’s shirttails, totally ignored, tell this woeful tale of feelings of displacement and dismay. Tearfully, Spot waddles off into the rainy night only to end up marooned atop a tree. But wait! Here comes Henry and the dog and it’s the dog that jumps in the rising water to save Spot. It’s a nice moment, because Spot in turn tries to save the dog (though ultimately it’s Henry and his fishing rod that manages the rescue) bringing the story nicely back to where it started, with ‘The Perfect Present’. This touching story cleverly focuses on the relationship between Henry and Spot. And the sharply outlined black and white drawings with splashes of colour make this an edgy book with its very own charm. A softer treatment would have rendered things too saccharine, as this is essentially a dramatic story with a deeply serious message. For any child who has felt replaced, overlooked or jealous this story of constancy and love has huge resonance. It is deeply reassuring to witness loyalty working its brave magic, and will go a long way to helping those suffering from sibling rivalry. A good book for discussion.